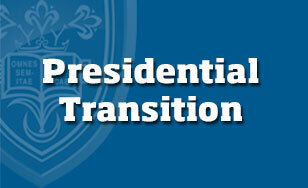 We are very pleased to inform the College of St. Scholastica community that our presidential search is progressing. We are writing to provide you with an update on the progress made since our last report to you a few weeks ago. We received many applications from highly qualified candidates. Over the past few months, the Search Committee carefully considered each applicant's extensive written materials. The Search Committee then identified eight excellent semi-finalists. Over the past few weeks, we conducted multiple reference checks on each of those candidates. Last week we conducted in-person preliminary interviews with those candidates and identified two thoughtful and engaging finalists. As you know from our previous reports, the final phase of our recruitment effort includes an invitation to the finalist candidates to visit campus. We are close to finalizing the schedules for campus visits and are providing you with a sample two-day schedule. We will share the final schedule for campus visits in the next few days. We will provide the community with the name and resume for each of our two finalists two days prior to each candidate's visit. The schedule will include opportunities for various College constituent groups, including individuals at our various sites, to meet with each of the candidates. As noted below, the Mitchell Auditorium open forums will be accessible remotely via Adobe Connect. We strongly encourage everyone to participate. The purposes of these campus visits are two-fold. First, they will enable us to know the candidates better. Second, and perhaps more important, they will allow us to further acquaint the candidates with the College of St. Scholastica community and provide the Search Committee with feedback from the community. Throughout the search process, the Search Committee has pledged to protect the identity of the candidates. While we can no longer promise complete confidentiality to these finalists as they present themselves on campus, we urge you to bear in mind that each of them holds a significant position elsewhere, and we would appreciate your not making personal inquiries about them. Instead, please communicate your comments, questions, or concerns to us. Those of you who are able to meet with each of the candidates will be asked to complete an on-line response form that will allow the Search Consultants to capture your feedback. This information will be tabulated and shared with both the Search Committee and the Board of Trustees as they deliberate on both the strengths and limitations of each candidate. We anticipate that the Board of Trustees will make its selection of the next president within a few weeks of the finalists' campus visits. We are pleased with the progress of the search and look forward to this final phase. Thank you for your continuing support and assistance.